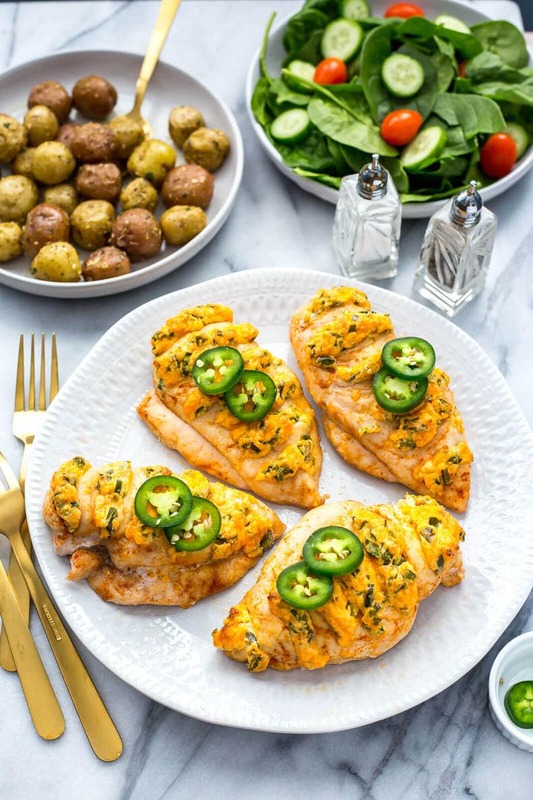 This Hasselback Jalapeno Popper Chicken is a delicious and creative stuffed chicken breast recipe – all you need is a bit of light cream cheese, cheddar and some fresh chopped and de-seeded jalapeno peppers! 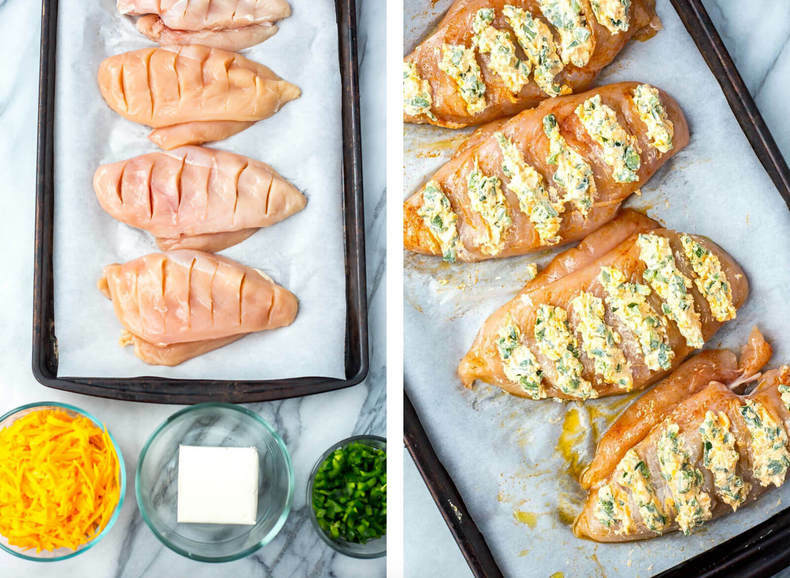 Can we just talk for a second about the pure GENIUS that is hasselback chicken?! Like, you get a TON of flavours packed into what used to be a boring old chicken breast, and there's none of that complicated stuffing and cutting open of the chicken – just little slits that you fill with cheese and peppers and all kinds of deliciousness. Super easy, no mess, no fuss. 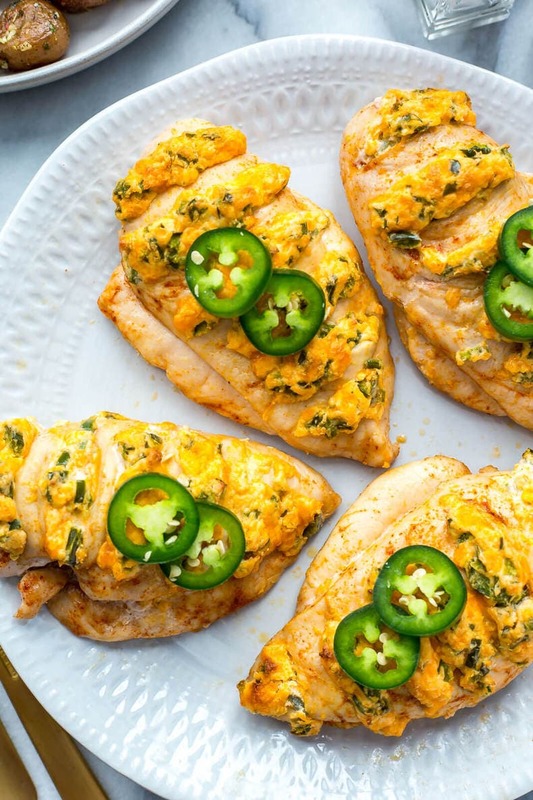 That's what I'm all about for dinner these days, and that's where this Hasselback Jalapeno Popper Chicken comes in. I think jalapeno poppers are my fave appetizer of all time – it may be because you only get like 9 of them in a box so you're already dealing with the scarcity effect of worrying you won't be able to eat enough, or it may be because they really are just that amazing. Like think of it. Jalapenos, cream cheese and cheddar. I couldn't think of a better combination. I whipped up a simple batch of this 3-ingredient stuffing, cut some width-wise slits across each chicken breast (make sure you get them deep enough to stuff them!) and then went to town. The result was some amazing chicken, and if you're wondering, it's not that spicy either! You just have to make sure you remove the seeds from the jalapenos entirely. I wish I had thought to show this on video, but you basically want to slice the jalapenos lengthwise and then cut around the piths and the seeds of the pepper to remove all the seeds. Jalapenos are actually quite mild when you get rid of all the seeds, it's surprising! I seasoned the chicken itself with just a bit of paprika, salt and olive oil ahead of time but I don't even think you really need the paprika as the jalapeno popper filling is so flavourful! 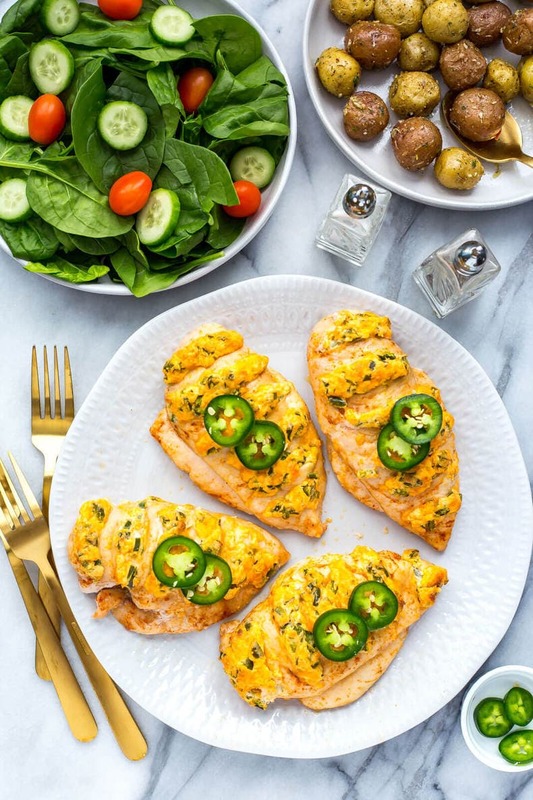 Drizzle on some olive oil and season with salt before stuffing them pop these Hasselback Jalapeno Popper Chicken breasts into the oven for 30 minutes. I also serve these with some potatoes and salad, but it's up to you to decide which sides you want. I like to get some baby potatoes roasting in the oven ahead of time while I'm stuffing the chicken then make the salad while the chicken's cooking in the oven. I used light cream cheese to keep calories down, so you're looking at a fun, flavour-filled dinner idea without everything being too overwhelming or too rich. 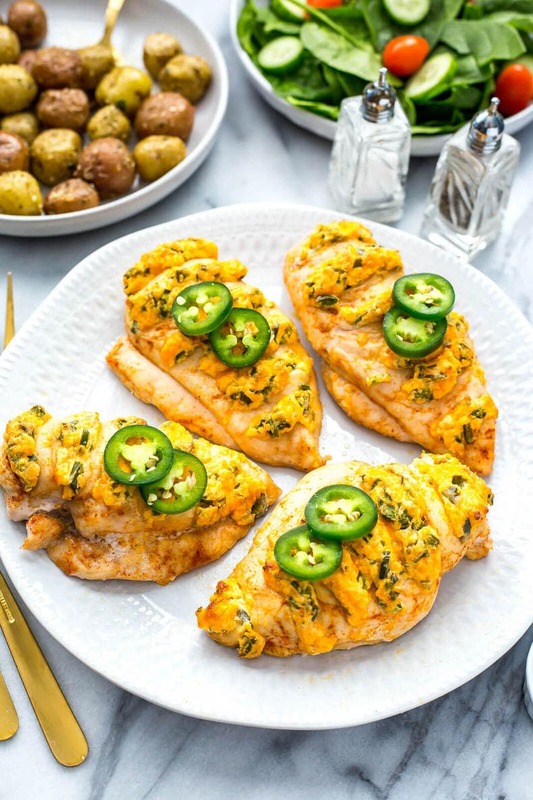 You could probably even eliminate the cheddar if you don't want to spend too much money on too many ingredients – definitely be sure to keep the cream cheese in there though because that's what really makes this Hasselback Jalapeno Popper Chicken pop. I think we can all agree that chicken can get boring. It's fun to switch it up every once in a while and try something new where chicken is the star. I'm always looking for new ways to dress up chicken breasts – I think you can see that in these Hasselback Fajita Stuffed Chicken Breasts and these Asparagus Margherita Chicken ones. 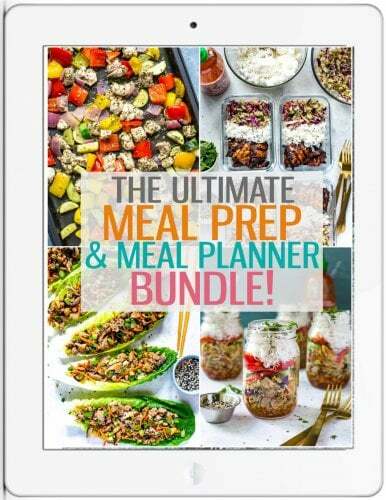 Really, there are just so many ways you can get creative, especially now that grilling season is back! 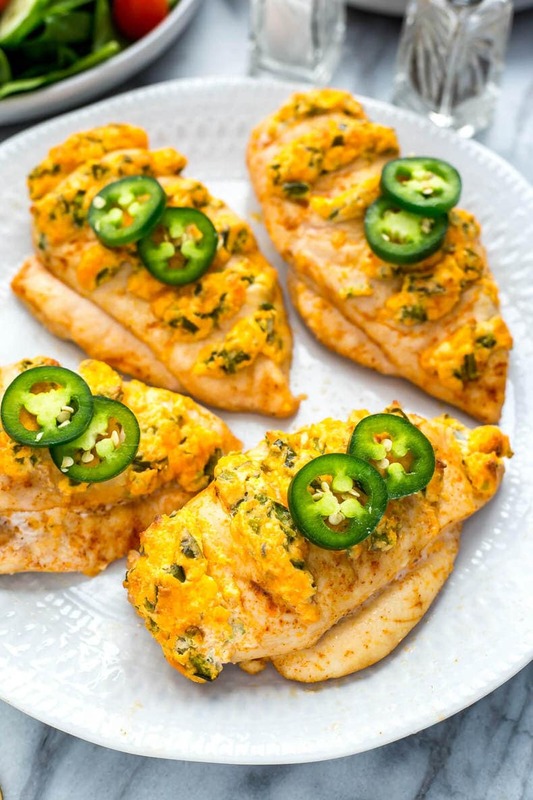 If you don't have jalapeno peppers on hand you can honestly try this chicken with regular bell peppers as well. By the time you remove the seeds from the jalapenos they become so mildly spicy that even bell peppers would be a good substitute. I know I always have a ton of peppers on hand in the fridge that need to be eaten up (I actually think they are the vegetable I buy the most!) so don't be afraid to sub in different veggies! 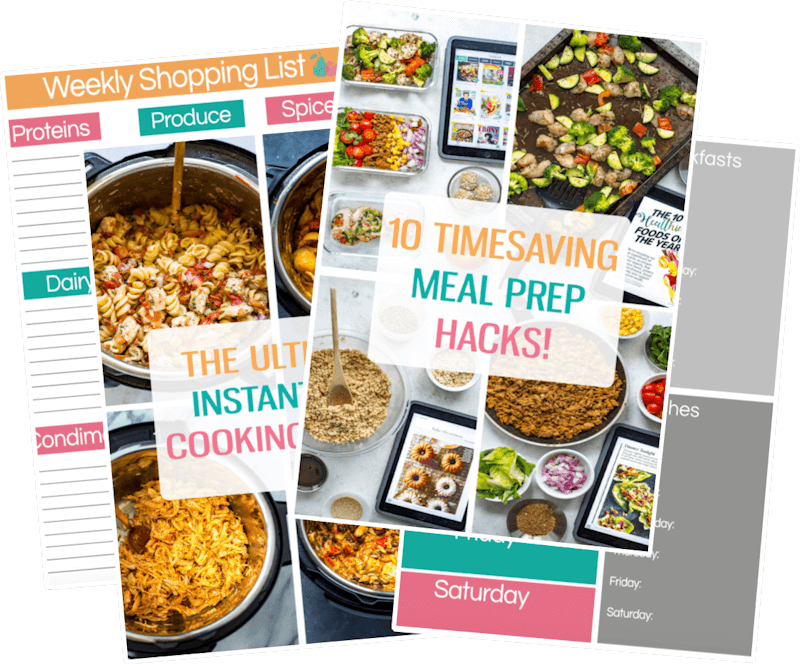 I'm all about switching things up and making substitutions so you can waste less food. 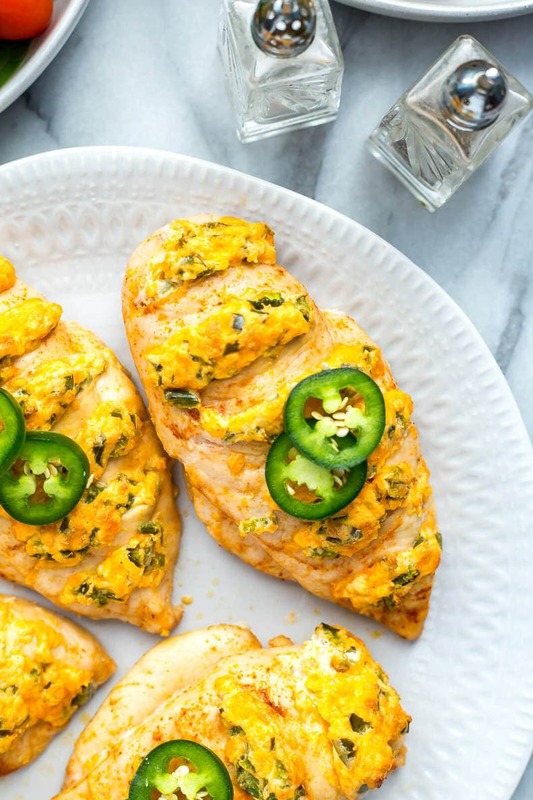 Will you be making these Hasselback Jalapeno Popper Chicken Breasts? 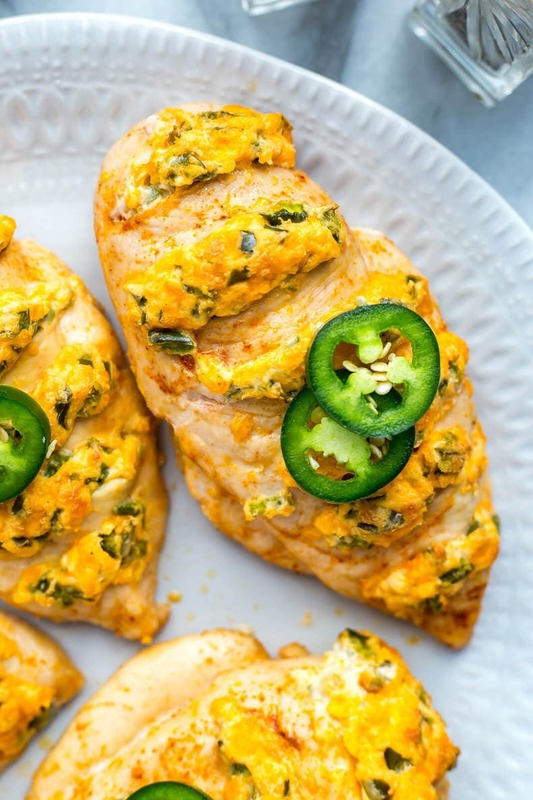 I'm absolutely in love with the spicy, creaminess that is this chicken! 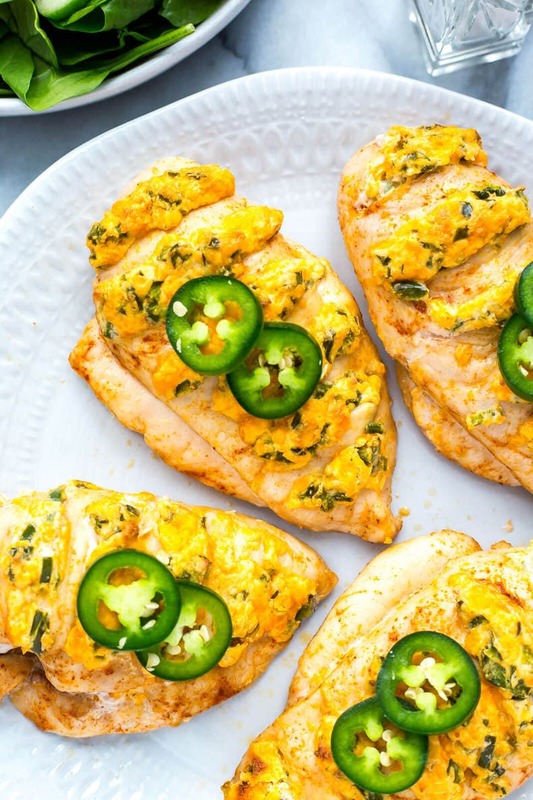 Try it on the grill or in the oven today – you won't regret it! 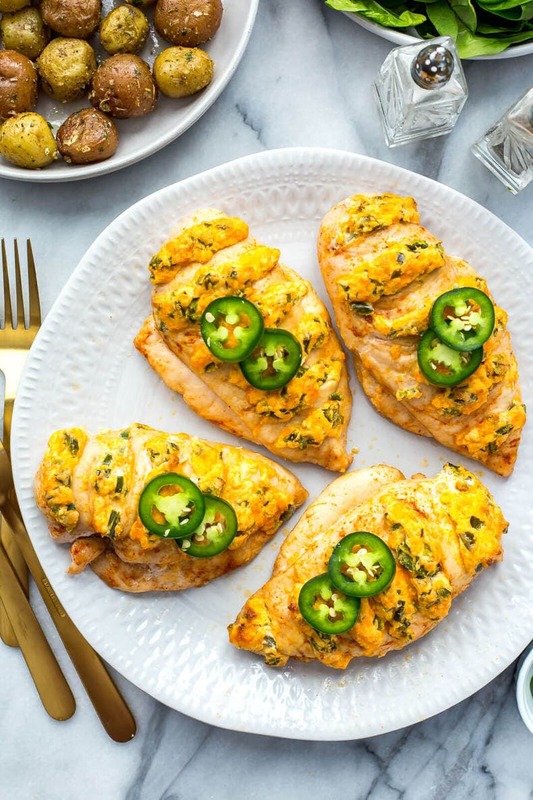 This Hasselback Jalapeno Popper Chicken is a delicious and creative stuffed chicken breast recipe - all you need is a bit of light cream cheese, cheddar and some fresh chopped and de-seeded jalapeno peppers! Preheat oven to 375 F. Slice into chicken widthwise making cuts deep enough to fill (see video for details). Drizzle olive oil overtop and rub with paprika and salt. In a large bowl, microwave cream cheese on high for 45 seconds (make sure to cover dish otherwise it will make a mess of your microwave!) Remove from microwave then stir in cheddar cheese and jalapenos. Stuff each little slit with jalapeno-cheese mixture. Bake in oven for 30-32 minutes until chicken is fully cooked. Serve and enjoy!